Last week I posted a copy of a letter I wrote to our State Superintendent of Education on my blog and learned a few things. 1 – The topic of standardized testing is a hot button, and the majority of people think it has gotten out of hand. 2 – While the far majority of people have been overwhelmingly supportive, some people who don’t even know me have suddenly become experts on my motives. Let me assure those critics that my motivation is not political, to get a job at the state level, or to use my blog to launch a writing career. Rest assured that my main motivation is to eat chocolate and watch Netflix amid the essay grading. 3 – If you post a blog a day or two before a Snowpocalypse (or Rainpocalypse in my case), there is a much greater chance of it going viral because teachers who are out of school spend lots of time on Facebook. 4 – My students in 4th blog know all about the Kardashians but have never heard of The Washington Post. This serves as further proof that I have job security. I have spent a lot of my time this weekend scratching my head and wondering why a teacher in Coweta County, GA, claiming that she needs more time to teach as opposed to administer standardized tests is so newsworthy. After all, I have never spoken to one teacher who wants to test more or one parent who wants his or her child tested more. So why all of the hype? George Barna used to tell a story about a frog that has stuck with me for decades. 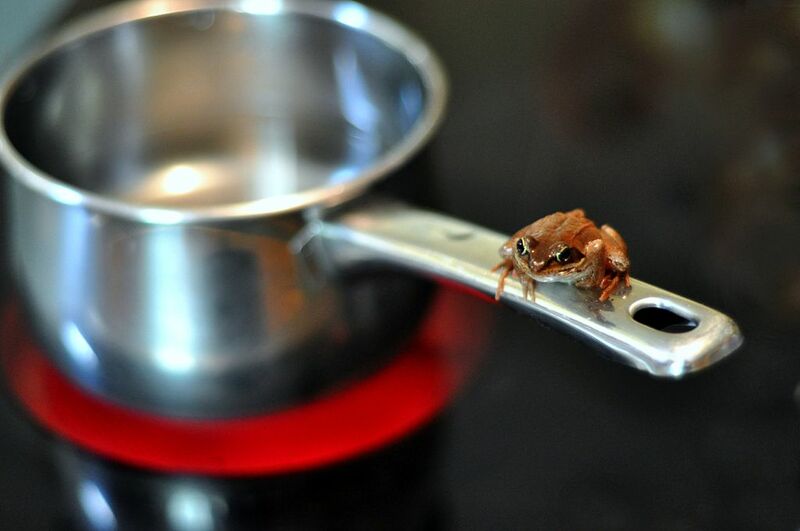 The theory is that if you drop a frog in boiling water, it will immediately feel the threat of heat and jump out. If, however, you put a frog in a pot of cool water and slowly increase the heat to boiling, the frog never notices and will cook to death. This sounds like an excellent experiment for a STEM class. I have never tried this and cannot attest to its validity, but the analogy has some striking similarities to education over the past few decades. No one in his or her right mind would have created a system with the amount of testing that we have today, and if someone did and tried to implement it all at once, the public would never put up with it. However, over time the heat has been slowly increasing in our schools by continually adding a test here and there, and we are now near the boiling point. Fortunately, we are unlike the frog in that students, teachers, administrators, schools, and systems are feeling the heat and trying to make a jump before we cook to death. The time has come to turn the heat down with the right reasons in mind. I do not want to be known as an advocate for teachers. I do not want to be known as an advocate for less testing. I do not want to known as an advocate for any particular political party (especially this since I am not loyal to one party over another but vote based on issues). I want to be known as an advocate for students. In my mind the real issue is not standardized testing, teacher morale, or politics; the issue is student achievement. We have a saying at my school: “Northgate is committed to student success.” While student success cannot not be easily measured, it must be the focus of education and educators. Teachers and parents must advocate for students and what is best for them. You do not have to fire off a letter to the State Superintendent of Education after teaching a rhetoric unit like me to be an advocate; attending PTSO meetings, maintaining good relationships with teachers and administrators, and keeping abreast (a word I cannot use in the high school classroom) of current education policies are a good start for advocacy. When the best interest of students is at the forefront of every decision in education, issues concerning teacher morale, standardized testing, and education reform will no longer be issues. I am naive enough to believe this, and if you are not, don’t burst my bubble. What is one way you can advocate for students this week? I’m glad I know you and that I can call you friend and a very gifted thinker, writer, and true educator. Way to rise above the fray! And to think, we were born on the same day in history! Thanks, John! Miss y’all – maybe we can all celebrate our BIG birthdays together this year! !